Today’s sparse talent pool increases your chances of a hiring mistake. But a no-fault divorce approach allows you to release mis-hires quickly. And despite the lack of available talent to choose from, the pressure from hiring managers to “get me, anybody, I need butts in chairs” is immense. So, it’s not surprising that hiring mistakes are increasingly common. And, with the average hiring error rate at 46%, it’s simply too expensive to let a large number of mis-hires stay on the job for a prolonged period of time because of the damage they do. Unfortunately. because the standard performance management process is so painfully slow and ineffective, it’s a leap of faith to expect it to weed out poor performing new hires. What is needed is quicker and less disruptive alternative, which I call a “new hire no-fault divorce” approach. This intuitive approach allows you to quickly release new hires that are not working out while minimizing conflict and avoiding the threat of legal action. This “no-fault divorce” concept is tried and proven. A similar process was pioneered by Cisco during the last major war for talent at the end of the nineties. To minimize the damage from its weak hires, this release mechanism was implemented because their data showed that after six months on the job, there was little probability that the already weak performance of a new hire, would significantly improve over the next six months (yes you read it here, weak performers do not get better). Here’s how this “no-fault” process works. A new hire’s performance is assessed at six months. The process to quickly get rid of bad hires starts in the sixth month of employment. The process begins with the premise that in order to formally fire someone, there needs to be a significant volume of hard data showing that they don’t meet the performance standards. Unfortunately, with new hires, because their tenure is measured in months, there just isn’t a great deal of performance data. So, HR accepts a lower goal which is to convince the poor performing new hire to resign voluntarily. The no-fault mechanism begins at the six-month point, where it identifies weak performing hires. HR then projects the estimated performance trajectory of each weak new hire for the remainder of their first year. HR then targets those whose performance is projected at year-end to be below the acceptable standard for release. The goal is to get the targets to resign and thus avoid legal issues after six months of employment. The employees that are projected to have continued bad performance are approached by HR. HR reveals that statistics indicate their chances of success by year-end are extremely small. At that point, HR offers them the option to stay on the job or to leave immediately. If they agree to leave now, HR offers them between two- and five-months’ severance pay. And, because their continued weak performance is only projected, they get to leave with a positive job reference. As part of the severance package, they also agree to keep their termination quiet and to sign an agreement not to sue. Now some may argue that the firm is “rewarding for poor performance.” However, the cost of the projected severance payment (even at five months) is usually much less than the value that will be added if the weak current hire is replaced with a top-performing new hire. The carrot and stick approach gives the new hire a low and a high-risk choice. If they don’t want to accept the immediate severance, they still have the option to choose to stay on the job for the remainder of the year. However, the risk is that if their projected weak performance level actually turns out to be accurate, there will now be enough performance data to terminate them formally. And, with that formal termination, they lose the severance option and leave with a now fully justified negative reference. This carrot and stick approach encourages more than the majority to take the early exit option. In the case where the promised work situation dramatically changes, this mechanism gives both sides an out. In many cases the bad performance is a result of disruption related to the job. In fact, research reveals that 61% of new hires are unhappy because they feel that they had been misled during the hiring process (Harris Interactive). In these cases where the job was oversold, the actual job that they encountered turned out not to be the job they were promised during the hiring process. The new hire ends up disillusioned, and that affects their performance. In other cases, the expected work situation actually changed dramatically after they were hired (for example their hiring manager left). In both cases, the performance deficit and the unhappiness may not be the entire fault of the new hire. Without having to assign blame, it makes sense to arrive at a “no-fault conclusion” and then offer the new hire the severance package with a positive reference. Obviously, recruiting leadership then needs to be made aware of any overselling. Because it’s a no-fault approach, both the new hire and the company at least partially benefit from this early release approach. 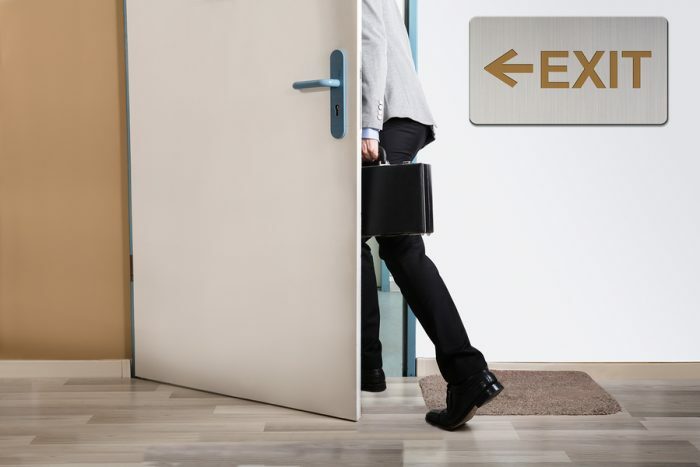 Benefits to the new hire – Candidates know they have a relatively painless option to “opt out” after six months on the job. This may help recruiting because some “on the fence” candidates might accept an offer they might have otherwise This option will improve your offer acceptance rate. Also, being able to leave with some money and a good reference might also directly help reduce some of the new hire’s anger after they find out the job wasn’t what was promised. Getting them to leave while happy could prevent the ex-employee from damaging the firm’s employer brand image on social media. Benefits to the company – This approach allows the firm to jettison a weak performer in half the time it would normally take (e., instead of waiting for their first year-end formal assessment). And, getting rid of any new hire that doesn’t “fit” also reduces the damage they can do to the corporate culture. Having new hires leave reduces the team trauma quickly that would have occurred if you waited and lost a long-term employee. Weak employees also take up to 17% of a manager’s time (Robert Half), releasing them frees up managers to do other things. Finally, knowing they can much more easily release a new hire that doesn’t work out, hiring managers will take more risks on an exciting candidate with a few iffy characteristics. In addition to the above no-fault divorce mechanism, there are other release options to consider. Put all initial hires under a temp-to-perm contract – The hardest thing to accurately assess during even an extended interview period is cultural However, you can extend your cultural fit assessment time frame by putting all new hires under contract for “a cultural and job tryout.” This alternative approach has been successfully used by Joor, a wholesale market connector firm, and HR vendor Entelo. During Entelo’s well-paid usually 2- to 4-week trial both sides get to make an extended assessment before making a commitment. Entelo has found that “75 percent of candidates who go through the trial get a job, while the other 25 percent are people who, had they been hired, would have been let go.” In another variation, historically Whole Foods also allowed employees to vote on new hires after an on-the-job trial period. Why not just use the standard performance management processes? – Most firms do rely on the standard performance management process to get rid of new hires. Unfortunately, almost without exception, I find corporate performance management processes to be ineffective. Utilizing this process usually means you will have to wait an additional 6 to 18 months before you can terminate a weak new hire. And during that waiting time, the recent hire will continue to underperform and to take up a slot that could be filled by a better performing new hire. The no-fault divorce mechanism outlined here is easy to understand because it is quite intuitive. The minimizing of blame is a familiar approach because it has been used successfully for years to mitigate conflict during often dramatic marriage separation. In my experience, this approach is becoming even more necessary every day as the demand for talent skyrockets, while the percentage of weak prospects in the candidate pool continues to increase. Of course, the first step requires individual recruiting leaders to acknowledge that their hiring errors are increasing. The next step is to add a focused effort for speeding up the initial identification of weak hires and then add the “no-fault” option to ensure the quick, but painless release of these “weak and won’t get better hires” that somehow get through the hiring process. In my view, the ever-increasing odds of getting a weak hire makes today the perfect day for adding a “quick release valve” as a formal follow-up step to your hiring process.